Cradled in the lap of mountains at the foothills of auspicious Trikuta, besides the river Tawi at an altitude of 1030 ft. is Jammu. This 'city of temples' has many places that are flocked by people from every nook and corner. Among all these, also comes the famed university of Jammu. A place, where imparting education is not considered just as a mere duty, but as a commitment towards the advancement of the society. A university with a vision and a single-minded mission. make Jammu university a name to reckon with. 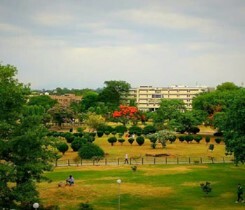 A saga that has been continuing from the time of its inception.The University of Jammu, accredited as 'A' grade University by National Assessment & Accreditation Council of India came into existence in 1969 vide Kashmir and Jammu Universities Act 1969 following bifurcation of the erstwhile University of Jammu and Kashmir. The University provides instructions in such branches of learning as it deems fit and makes provision for research and the advancement and dissemination of knowledge. The University stands for spiritual and material elements in life, thirst for knowledge and virtue under the backdrop of holy peaks of Trikuta Hills. 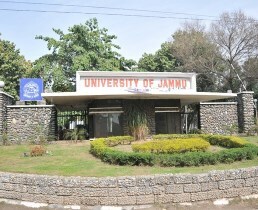 University of Jammu holds examinations, grants degrees, generates knowledge and confers diverse academic distinctions on persons who pursue approved courses of study in the University or in constituent colleges/institutions approved for the purpose also for those who appear as external/private candidates. It also confers honorary degrees or other distinctions on the persons of exceptional caliber. The University also admits, maintains, recognizes, affiliates colleges and other institutions. It is primarily a research, teaching, affiliating, examining body involved in promotion of arts, science and other branches of learning. The University is open to all classes and creeds with the sole objective to carry people from darkness to light..